10 preset menus for different Indian recipes24 hours preset timer function for delayed cooking, High-quality full glass panel for a premium finish and easy cook, Sensor touch keys for ease of use, Auto-off program cooks food safety more, Cool-to-touch surface cooks foods safely, Warranty: 1 year on the product. Philips offers the HD4983 Induction cooktop, which is fast and easy to use for those of you who are tired every day of cooking in gas stoves. The induction cooker sticks to food nutrition and reduces the loss of vitamins during cooking. You no longer have to face the hassles of gas running out every month with this induction cooktop in your kitchen. And now, without an odorous and messy gas stove, your kitchen looks cleaner. 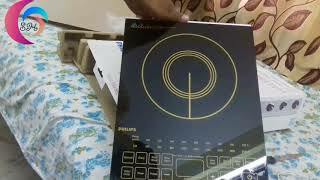 Experimenting with Indian recipes is also more fun in this induction cooktop with the 10 preset menus. Simple, sleek design has been added to the cooktop. The glass panel has a premium finish and easy cooking quality glass. The cooktop is extremely efficient and loaded with smart, easy to understand and use features.